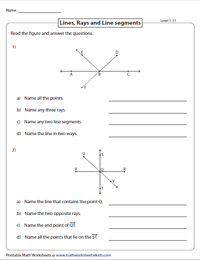 This ensemble of worksheet forms a perfect launch pad for students in Grades 3, 4, and 5 to pick up the basics of geometry. 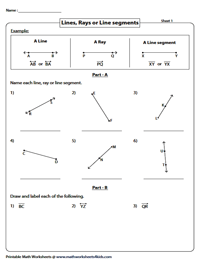 Help them gain a better comprehension in identifying, drawing and labeling points, lines, rays, and line segments. 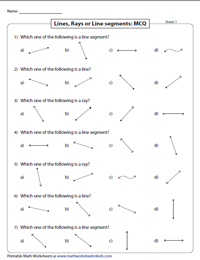 Employ our printable charts, interesting MCQs, word problems and much more. 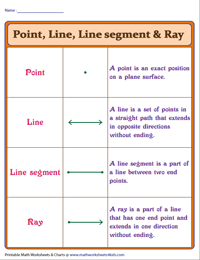 Pin up these vibrant charts and help students identify and differentiate among points, lines, rays and line segments. Definitions for each type are also included here. The first part of this exercise requires learners to observe each model and identify them as either a point, a line, a ray or a line segment. The next section necessitates students to draw them. 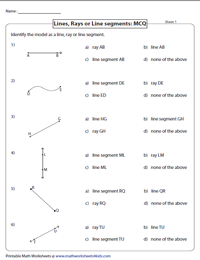 Employ these MCQs that feature pictorial representations/models of points, lines, rays and line segments. Get learners to mark their answers. Use the answer keys provided to verify their responses. In the first section, students need to name each model and represent the lines, rays or line segments along with their symbols. Read each symbol to draw and label the models as described in the next section. Based on the models provided in this series of MCQs, choose the correct option that best represents them. Download and print these worksheets that make for great in-class assignments. Solve these exclusive word problems. Read the given figures and answer the questions below. 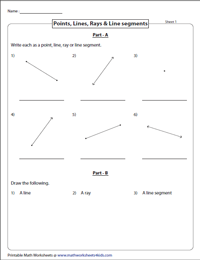 Worksheets have been split into two levels to enable easier downloads.